The 32nd International Geographers Congress was held in Cologne from 26th to 30th August. Over 2400 delegates from all over the world participated. Under the motto “Down to Earth” a representati­ve showcase of topics was presented, the issues and solutions that illustrate Geography’s contribution to many urgent problems affecting humankind. Furthermore, the congress main objective was to ensure accessibility for geographers of all ages and from the global south and north. In the final analysis, the IGC 2012 turned into a forum for a focused exchange of ideas within the scientific community and a memorable festival of and for Geography. The main concepts of the Congress are best summarized in the following diagram. The main objective of these geographers was to bring the wide-ranging perspectives and methodology of their subject to bear on these four major complex themes and contribute to the solution of urgent scientific and socio-political issues – bringing research down to earth. For the SPACIT project it was a valuable occasion to promote spatial thinking and education for Spatial Citizenship. The contributions of SPACIT members have been manifold. For instance, Detlef Kanwischer from the University of Koblenz-Landau was co-chairing the session “Spatial Thinking I” and Diana Sinton from the University of Redlands presented on “Building a spatial literacy program in teacher education” in the session “Spatial Thinking II”. Thomas Jekel from the Z_GIS, University of Salzburg was in charge of the session called “Geographic Information Systems, Society and Education”. Together with Nicole Ferber, Thomas Jekel also presented on “Forward to Basics. Education for active citizenship in a spatially enabled world”. In the session chaired by Thomas Jekel,, Uwe Schulze from the University of Koblenz-Landau in co-operation with Detlef Kanwischer presented the topic of “GIS Education on the test: Findings from a systematic review in GIS education research”. A special attention was drawn on prima facie fact that there is still little empirical evidence of the usefulness for the implementation of GIS in educational processes. Therefore, there is need for more focus on a consistent research framework to provide a systematic access to findings in the field of competence-based GIS Educational Research. In the same session, Tilo Felgenhauer, Friedrich Schiller University Jena, presented on “Expanding AND shrinking worlds of geo-communication“. From a social theory perspective, he framed the interaction between technology and its users as translations between expert and lay knowledge and between different spatial languages of system and user: numerical code/algorithmic processing vs. deictic expressions/lifeworld experiences. Inga Gryl (University Duisburg-Essen) and Robert Vogler (Z_GIS, University of Salzburg chaired the session “Geo@web. Geography production and its lifeworld consequences in the era of the web 2.0”. Other SPACIT contributors at the IGC included Karl Donert (EUROGEO) who chaired three sessions: Digital Earth: an opportunity for spatial citizenship 1 and 2 and “Mapping the emergence of change: Future European perspectives”. From the SPACIT-related contribution at the 32nd International Geographical Congress it can be concluded that nowadays geomedia enjoy increasing popularity, yet their technological intrcacies are also becoming increasingly opaque to the lay user. This growing divide between the use and the understanding of geomedia technologies poses a challenge to both spatial and citizenship education. SPACIT aims to meet this challenge by developing teaching materials for Spatial Citizenship education – an education that aims “to expand the ‘shrinking’ knowledge of the production of seemingly perfect and handy life-world emulations”  and in so doing helps secondary school students to not only acquire technical knowledge and skills, but also develop reflective competences concerning geomedia use. The second main conclusion is that a need for a new conceptualisation of citizenship has been diagnosed – one from “dutiful” and “administratively bounded” towards belonging to geo-social communities. Through the competent use of geoinformation citizens are able to challenge dominant spatial narratives and to provide alternative perspectives in participatory processes of democratic decision-making. The SPACIT project has been launched for this very reason, with the aim of developing and making available the tools for achieving the learning outcome of reflective spatial competences as an educational goal. Participating in the IGC 2012 yielded many valuable discussions, suggestions and new insights as well as the transfer of knowledge about best practice examples from practitioners in the field. Felgenhauer, T. (2012). Expanding AND shrinking worlds of geo-communication: spaces of complex technology and the geographies of common lifeworlds. 32nd International Geographical Congress: Book of Abstracts (p. 625). 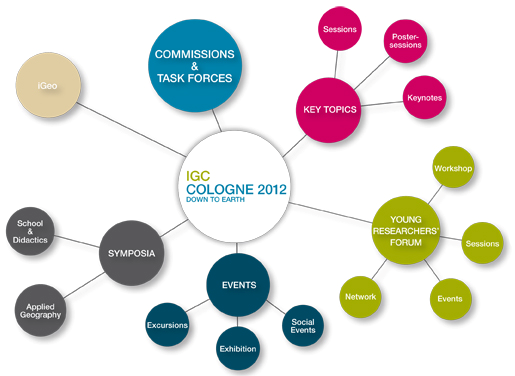 Rertieved from https://igc2012.org/frontend/index.php Presented at the IGC Cologne 2012 Down to Earth, Cologne, Germany: IGC 2012.